In this episode of Democracy Ideas, Peter Pomerantsev discusses modern innovations in Russian propaganda techniques and the effect they have on audiences within and beyond Russia’s borders. In an era of increased interdependence and connectivity, Pomerantsev argues that the Russian authorities have discovered ways to leverage and subvert the openness of the democracies by injecting disinformation into the global information space. Peter Pomerantsev is a Senior Fellow at the Legatum Institute Transitions Forum. He is also an author and documentary producer. His writing appears regularly in the London Review of Books, Atlantic, Financial Times, Foreign Policy and elsewhere, focusing largely, though not exclusively, on 21st century propaganda. Previously, Pomerantsev worked as a consultant on EU and World Bank development projects in the former USSR. He is author of a book about working as a TV producer in Putin’s Russia, Nothing is True and Everything is Possible (2014). Walker: In the modern information age, Russia has managed to maintain meaningful control over news and information. Why don’t we start with the domestic scene in Russia? Here we are in the era of globalization, the internet has proliferated around the world, and yet, when it comes to news about information and politics, it seems as though the system has managed to keep a hold on the news and information that counts. How do you see that? Pomerantsev: Firstly, there is a system of control which is very centralized. 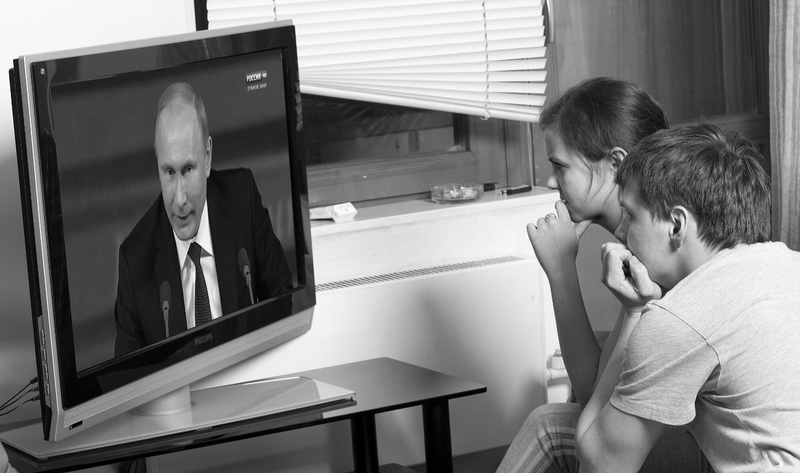 So, the first thing that Putin did when he comes to power in 2000 is to seize control over TV. He gets rid of the oligarchs who controlled it and then puts it into the hands of friends or into the hands of the state. There is also a very simple, physical, centralized process where the heads of the TV channels meet in the Kremlin once a week. They are told who is allowed on TV, who is not, what the agenda is, what the framing should be, and what the narratives are. It is all scripted like a movie, in that sense. It is very, very, very centralized. That is really quite old school with that sort of top-down instruction. What is innovative is that they play with narratives and ideology in a more sophisticated way. For example, if communist news was a joke and they just lie about what was going on in the country, and if there was a flat monotone giving you the communist ideology that no one believed in, the approach now is much more subtle. Firstly, they do show bad news, they just frame it in a certain way. The news will start about Putin—because Putin is at the top of the social pyramid—then something bad happening in Russia, but right after that something much worse happening in Ukraine. They do try to include people’s reality, but they have learned its best that they leak the bad news first—they do not want another Chernobyl. The main thing they have done is create almost a simulacrum of debate and discussion. You will have a pseudo left-wing opposition party riling with a pseudo right-wing opposition party in current affairs debating shows. The idea is to make Putin look good by contrast. They have gotten much more sophisticated and supple in their approach, and much more liquid in their approach to ideology. Walker: You have described the domestic scene and innovations that have emerged in recent years. At the same time, the Russian authorities have seen fit to take their media beyond Russia’s borders, and certainly since the annexation of Crimea, people outside of Russia have come to pay more attention to this. What do you think are the most important features of Russia’s international media and what are its aims? Pomerantsev: Primarily it is seen as a weapon. It is not seen as classic public relations or propaganda in the sense of persuasion, public diplomacy, or making a case. It is seen as a weapon—part of the arsenal of foreign policy with which to divide and conquer, sow confusion, and subvert. It is a very different approach to media. The news channels might look like news channels—they even borrow some of the opening credits from a Western show—but their purpose is very different. The heads of Russia’s TV channels talk about themselves as actors in an information war—a psychological war. That is already very different than our understanding of media. I would divide it into two things. One is the action they have on Russian speakers in the near abroad, which is a very intense one. For example, a poll back in 2006 in Estonia, showed that half of Russian speakers in Estonia (that is a fairly large amount of the population) rejected the idea that Estonia was ever colonized by the Soviet Union. They live in a separate reality, and once they live in a separate reality, they can be pushed towards theoretically instigating some sort of revolt or stirring up trouble for the Estonian central government. So that is one part that is a very intense area of concern. Something else the Kremlin is trying to reach out beyond that is to set up international news agencies like Sputnik and Russia Today which broadcast in English, Spanish, German, Arabic and are expanding. Their aim is very different. They try to see what is happening in the West and ride that wave. If there is a bit of anti-EU sentiment in Europe, they will try to fan that as much as they can because they want a weak EU. They certainly do not try to impose anything about Putin, or love of Russia, or loyalty to Russian imperialism as they would in Russian-language. They just try to muddy the waters, spread conspiracies, divide alliances, and so on. Basically, they worked out that the openness of the Western system—that which has made it more efficient than the Soviet one—is a weakness. The fact that there are open markets meant that you could send economic actors in who could mess with other people’s economies—most obviously as with Russia’s control of the energy system in a lot of Europe. The openness of media meant that you could seed disinformation very brazenly into these societies and start trouble inside of them. Even something like NGOs and culture—you could open your church or compatriots’ NGOs in the Baltics and use them to stir discontent. They worked out that our openness is also our great Achilles’ heel. The choice we face—and this is very sharp in the Baltics where they talk about this a lot, and in Ukraine—is do we become less liberal? Do we start shutting off TV channels? Or, do we start throwing out compatriots’ NGOs? But then, have we lost the point of the whole exercise, or do we find our own asymmetric responses to this asymmetric challenge? Walker: You have described this very difficult environment where Russia and other countries with the capacity and intentions to operate beyond their borders are essentially exploiting the open, democratic space. If you were to fast forward five years into the future, given the trajectory of the approach of Russian authorities in the information space, what do you see as the main challenges we should be preparing for in the coming years? Pomerantsev: This is not just Russia. China has something very similar called “the three warfares,” which is a mixture of media, legal, psychological, and economic war to secure control in Southeast Asia. Chinese propaganda in the West is quite soft, with Confucius Institutes—a classic soft power exercise. But, in Asia, it is very, very aggressive. When they wanted to arrest control over a shoal near the Philippines, it was like what Russia does around Ukraine. They launched a psychological attack on the Philippines by putting a military flotilla by their shores. They did a media attack calling the Filipinos “deranged radicals” for protecting their territory. There was a legal attack using some false maps. A lot of states have worked out that this is actually the way forward for conflict in the 21st century—contactless war, endless information, and psychological operations. We are entering an era of disinformation rather than information. We thought the 21st century would be the era of information, but we might be in for the opposite. It is going to be a century of lies, subversion, and psychological manipulation where victory is going to be very hard to define because in the old fashioned war, you came in, planted a flag, and annexed some territory—Crimea is very old school. Most of these battles are not going to be like that at all. They are going to be very intangible. They are going to be fought in battles of the will, in economic subversion. It is going to be very hard to understand who is winning and who is losing. It is going to be a very chaotic century, and we are going to have to build new institutions to deal with it. Authoritarianism Goes Global: "The Hijacking of 'Soft Power'"